Faced with losing their newborn son, Anna and Oleg, searched far and wide for an answer. They found it and a new birthday for their son at Mayo Clinic. After an ultrasound at 32 weeks into her pregnancy, Anna Ryabova, along with her husband, Oleg Pecherskii, faced a grim prognosis for their unborn son. "The doctors in Russia told us his kidneys were very small, that they had not developed according to his gestational age, and that he would likely die within five days of his birth," Anna says. But Roman miraculously survived, and on the 10th day, he was moved to one of Moscow children's hospital, where there was a nephrology department. There, a nephrologist told to Anna and Oleg that Roman's condition would lead to a number of disabilities: he would have difficulty walking, as well as problems with his hearing, vision and mental development. Oleg asked doctors there about kidney transplant as a possibility for Roman. They answered that it was not a good idea and that children under five years had little chance of survival, in Russia especially. Instead, doctors suggested peritoneal dialysis. "Nevertheless, we did not lose hope and were determined to do everything for our little son to get him out of disease. We staunchly believed in the best, and today we can say that our grit was rewarded by our very active and cheerful boy," Anna says. Oleg and Anna decided to find the way to make a transplant happen on their own. At first, they had a consultation with a transplant specialist at one of Moscow clinics. And Anna and Oleg, along with Anna's mother, were tested to determine if one of them could be a donor. Unfortunately, none of them were a direct match. "We were told Roman has a different blood type from family members, and that it is dangerous to transplant against blood type," Anna says. Anna and Oleg began looking to European countries for help but were told such a surgery was not possible. So they expanded their search for options to the United States and discovered that Mayo Clinic might be able to perform a transplant. "Oleg saw that Mayo Clinic has good statistics for transplant across blood type," Anna says. So they pursued the possibility of traveling to Mayo Clinic's Rochester campus, even though it would be a 20-hour flight from Moscow. They had to move quickly, because Roman was quite ill. While arrangements were made, Roman spent much of his time in intensive care. 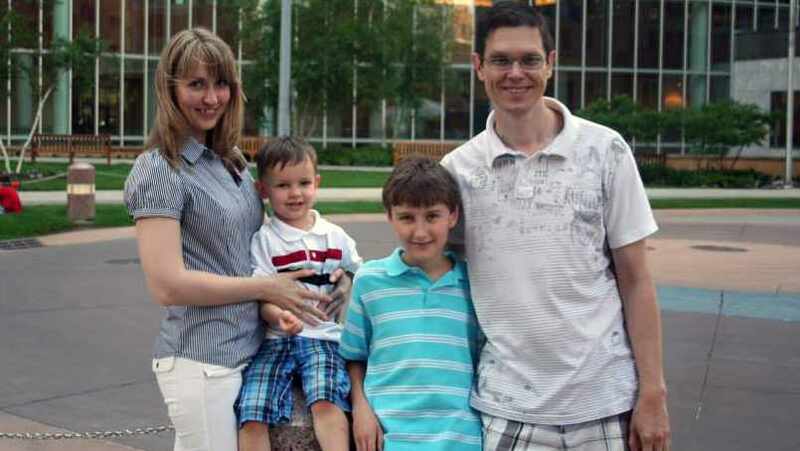 Doctors in Russia prepared Roman for the journey to the United States, and the family arrived in Minnesota in November 2010. The next morning after long flight, the family was in transplant meetings with the entire team — pediatrician, surgeon, nephrologist and transplant coordinator. "We were involved in the most serious medical discussion since Roman was born, and they told us their expectations," Anna says. A few days later, Roman's health had worsened, and doctors recommended he remain in the hospital until transplant surgery was possible. Going to the Emergency Department, Anna says her first question was, "Can I be with him there? I want to be with him." She was relieved when the nurse said, "Of course." Anna says she and Oleg often had to remain outside the door of hospital department where Roman was, per Russian hospitals rules, and that was very difficult for all of them. "He was crying, but we couldn't hold him," she says. "It was like a bad dream." Roman underwent procedures to prepare him for transplant surgery while at the Saint Marys campus of Mayo Clinic Hospital, as his family awaited word of a matched kidney. "And one morning, Roman's nephrologist, Dr. James Gloor, came to the room and he told us what we had waited to hear: 'We found a kidney,'" Anna says. Roman's transplant was possible through a paired kidney exchange. Paired donation is possible when someone is willing to donate a kidney, but the donor's blood and tissue aren't compatible with the person in need of a transplant. Rather than donating a kidney directly, the donor gives a kidney to a recipient who is a match, and another donor provides a kidney for the original intended recipient. In this case, Oleg donated his kidney to a Minnesota woman in need of a transplant, whose son, in turn, donated a kidney to Roman. The transplant occurred on Dec. 16, which also happens to be Anna's birthday. Anna waited for the surgeries to be completed so she could be with Roman and Oleg. She says the experience was very different from what she'd known previously. "Here, they reported every detail of the surgery. I was absolutely participating in the process. I knew what was going on with both of my boys," she says. Anna says she realized there was great concern for Roman, because, at 14 months, he was very small. There was a question of whether the kidney would be too large for his body. But it was just the right size. Oleg notes that the doctors said Roman was the youngest Mayo Clinic patient at that time to undergo this type of transplant. "This wonderful work was performed by Dr. Mikel Prieto and team. He is true magician in our opinion," Oleg says. Today, at age five, Roman is doing very well, Anna and Oleg report. They say that he is "absolutely healthy." Anna says the experience has changed her attitude toward doctors. "I was scared to communicate with doctors. In Russia ... Oleg every time pressed to meet with the doctors to know the treatment progress," Anna says. "Now I am a person who communicates with doctors – I'm not scared to be in a hospital anymore." She also says she is grateful for the support of Therese Moore, transplant coordinator. The daily visits from Moore to inquire how everyone was doing touched Anna. She remembers one day in particular when Moore was a much-needed presence. After Roman's surgery, the team came into the room to install a machine to assist with his breathing, should he need it. "Therese stayed with me outside the room, and all of a sudden we heard the sound of a child crying," Anna says. "We realized it was Roman. He had awakened, and he could breathe on his own without machine help. Therese said, 'Do you hear this amazing sound, just like when a child is born?'" Anna and Oleg say that they consider the day Roman received his kidney transplant as his second birthday, and that Anna and Roman, since the day of his transplant surgery, joyously celebrate their birthdays together. "When we drive by Saint Marys, we point out the window, and say to Roman — look, you were born here for the second time," Anna says. When she thinks about other families who may be facing a similar health crisis, Anna says that she would tell them to trust that they will able to participate in every step of their child’s treatment and feel confident that the doctors will do the best they can. She also notes that her peace of mind knowing that Roman would be well taken care of during his time at Saint Marys allowed her to leave the hospital to take care of her older son, Sergei. She knew Roman would not be alone because of the caring of the staff. "It is not just a job to them," Anna says. "They are people with big hearts." Finally, she says, she maintained a hope that everything would be okay. 'I'm glad to have had this experience," Anna says. "Here, they pay attention to human life, knowing it is precious. And it doesn't matter who you are or where you are from, you will be cared for." Explore Mayo Clinic’s Kidney Transplant department. Join others in discussing kidney conditions or transplants on Mayo Clinic Connect.